The Jeffrey Herlings MX2 freight train rolls on to almost runaway status after his fifth Grand Prix victory on the bounce here in Sevlievo, Bulgaria, and while Tony Cairoli was momentarily dethroned by Gautier Paulin in the premier class, the world champion was still able to maintain a record of at least one checkered flag in every GP this season. The tour has now visited Qatar, Thailand, Holland, Italy and Eastern Europe, and this weekend’s event featured a venue that ticks every box for a 21st century motocross event. Something of an irony then that the fast, wide and mostly flat Sevlievo hard-pack is pretty much old-school, featuring a natural setting (long uphill and downhills) and a layout that many of the riders were calling “easy”. The Bulgarians and fans from countries in this region of the continent obviously care more for their racing than practice and qualification judging by the disparity in the attendance from Saturday to Sunday. A reasonably good turnout for the motos cured a subdued atmosphere on the first day and the significance of only 20 riders being able to travel this far to make the MX1 gate was not lost on people in the paddock. Grand Prix is on the edge of transition, and the signs that an overhaul of some sorts is required has been recognised by the powers-that-be. The FIM Motocross World Championship presents a cosmopolitan, diverse and slick show but the time is ripe for bosses to meet around a table to decide the next path from the crossroads to try and help this series kick-on. 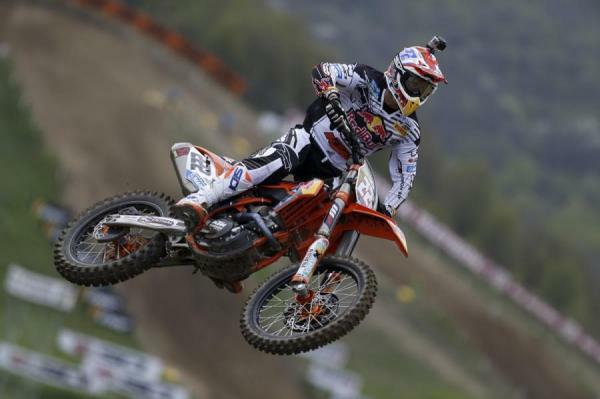 Paulin was able to repeat in Bulgaria for his first overall of 2013. What to take from Bulgaria? On this tapped-out circuit there was always a risk of procession with the lap-times so close. The track was a playground for some and a world of frustration for others. With the first two steps of the podium set, the last trophy was decided from the best piece of action of the day. Rockstar Suzuki teammates Clement Desalle and Kevin Strijbos duelled in the first moto (going 3-2 respectively) and then again in the second (3-4) to tie on points and allowing Desalle his first champagne spray since the overseas meetings. Strijbos is five years older than his countryman but his sprightly speed all weekend at Sevlievo and a meaty counter-attack in the first moto indicated that the veteran still has plenty to offer this MX1 collective. Cairoli finished second and still commands the points lead in MX1. The contingent that didn’t gel so well with the terrain included Ken de Dycker, who couldn’t find a start and was relatively anonymous after his starring role in the previous two rounds. Honda’s Max Nagl was also frustrated by his attempts to overtake Rui Goncalves for seventh and would crash late into Moto2. Tommy Searle was also set back by crashes but the 2012 MX2GP winner in Bulgaria was quick again on the Monster Energy/Pro Circuit Kawasaki and there is hope the MX1 rookie can keep his spirits high and aim for the top three in the near future. Outside of the strong quartet of Cairoli, Paulin, Desalle and Bobryshev (recovering from a fractured right fibula but expected back for Portugal in two weeks) Searle is the next most exciting prospect and many onlookers know we haven’t seen the best of the Brit yet. 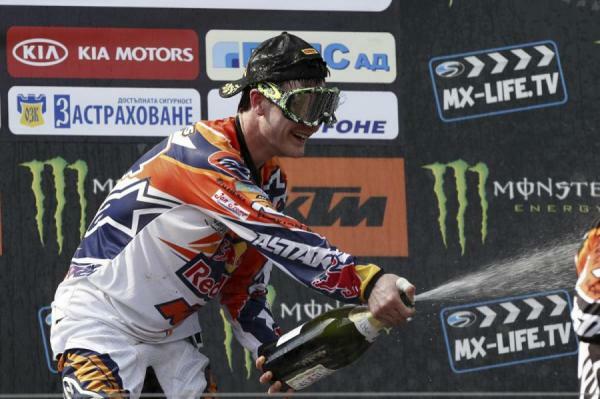 Herlings celebrates another win in MX2. Jimmy Decotis received another unusual taste of FIM Motocross World Championship and although he got very close to a holeshot in the first MX2 moto on the CLS Pro Circuit Kawi the New Englander still isn’t up to the pace to be able to register points in the top twenty. 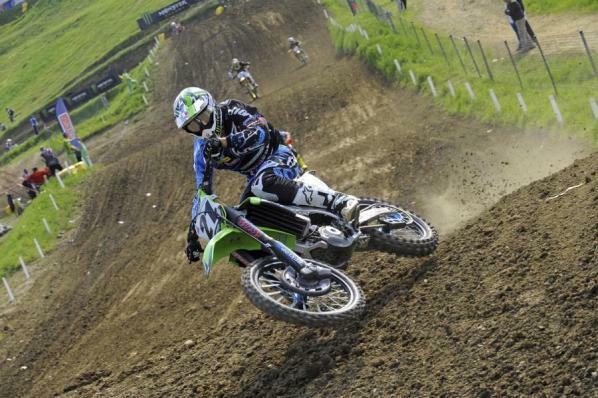 Check in with Racer X in the next day or two to read an interview with the youngster on his European mission. There will be a double dose of the Portuguese tongue next for the Grand Prix paddock with a trip to Agueda on the furthest west coast of Europe and then the long haul to Brazil in the middle of next month. 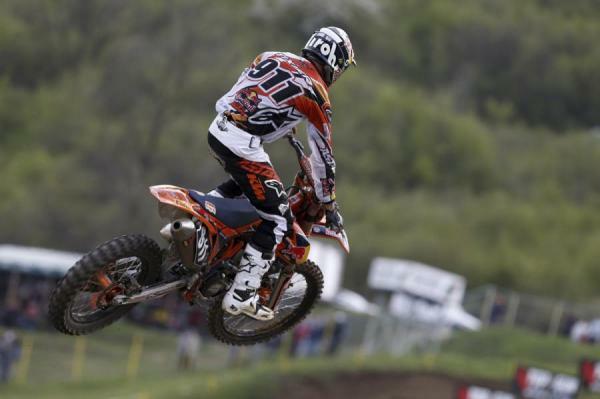 Jordi Tixier finished second behind teammate Herlings. 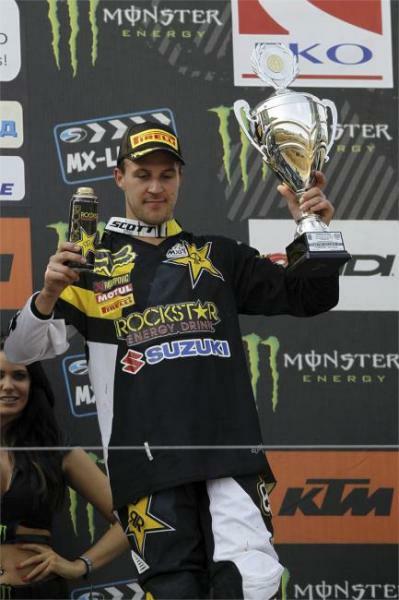 Clement Desalle would round out the MX1 podium.